It all started when a 3-0 pitch was called a strike. It was a bad call, anyone could see it was way high. Not even close. Ortiz had already thrown his bat aside and was ready to trot to first, when he was called back by plate umpire Tim Timmons. The at bat ended with Ortiz striking out. And then it happened. As Ortiz cussed and ranted on his way back to the dugout, the cameras hung on to his every move. The big guy was not going go down quietly. No way. We’ve seen David Ortiz do some damage with his bat this season, but the wild swings he took out on a dugout phone will go down as the most destructive. Let’s just skip over the fact that Papi’s wild tantrum could have killed his freshly minted 100 million dollar teammate. Dustin Pedroia sat within inches of the ferocious bat of his teammate. Typical Pedey, he never flinched. OK. He ducked for cover. If you missed it, here is the replay. Remember that scene from “The Shining” with Jack Nicholson? Papi is an emotional guy. He does not ‘speak softly and carry a big stick,’ like Teddy Roosevelt. Papi let’s his bat do the talking, whether he’s at the plate or in the dugout. Ortiz got tossed from the game. No surprise there. He got his best revenge the next day when he went 4 for 4 including a two run homer. After he hit that home run Sunday, he playfully pretended he was going to smash the newly replaced dugout phone box again. I liked that too. Let’s just forget about anger management, and what kind of example this sets for kids who saw the incident. Please. Can everybody just lighten up? Papi’s teammates did, that’s for sure. 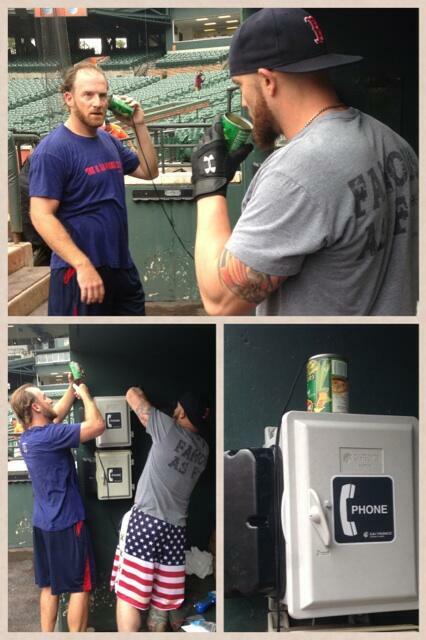 Like the yucksters they are, Ryan Dempster and Jonny Gomes strung together a couple of vegetable cans with some string, right there in the same dugout. Then, according to reports, they had this conversation. Dempster: Can you hear me? Dempster: Ok, let’s go straighten out the bullpen phone now. Our friends at Verizon would be proud. NESN’s Jenny Dell captured the photo and sent this tweet. Dempster has a background in stand up comedy, and this bit was really funny. We may see the parody soon on Saturday Night Live. Much has been made of the Red Sox “intangibles” this season. The bat, the busted phone box, and the tin cans attached with string taught us something else about the personality of this team. The Red Sox have a sense of humor. Let’s add that to the intangible list of character, team chemistry and respect for the manager. In the end, it’s all about getting the last laugh.